When you see the beautiful red fish hovering over a coral head with its pectoral fins splayed out widely and the venomous white tips of the dorsal spines flowing like a bird’s feathers you can’t help but be a little bit in awe. Without any natural predators the invasive lionfish in the Atlantic is fearless and his bold confidence shows, like a heavyweight MMA fighter strutting through a crowd and feeling invincible. Touch the lionfish and its venom will flow into your hand like a red hot poker under the skin, lighting up your nerves as if you just stuck your hand into an angry nest of hornets. However, the lionfish deserves our respect not just because it is dangerous but also because it is such a successful hunter and breeder, making it able to swarm an ecosystem and devour huge concentrations of shrimp and juvenile fish off of a reef. The tremendous hunting ability of the lionfish combined with its inherent beauty makes it a popular aquarium resident, and ironically the same allure led to its release into our waters. 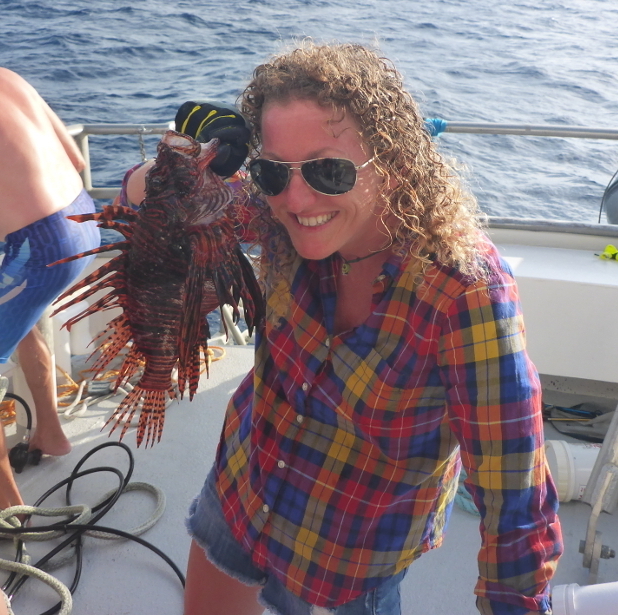 This same beautiful red invasive lionfish brought me back to scuba diving. In lionfish I have found what often feels like the ideal quarry for my hunting pleasure. It’s prolific, fearless and easily approachable, incredibly tasty and of course, that venomous sting. A prey that can ‘bite back’ adds just enough danger, just enough risk to make the heart beat a hair faster and give one a moment of pause to make sure you’ve got your act together because this is no joke. I would encourage all divers who have become complacent, maybe a little bored with looking at the same reef fish over and over, to consider lionfish hunting for its excitement and sea-to-table satisfaction. Because the lionfish’s white, flaky meat is so delicious I think I would love lionfish hunting even if they weren’t an invasive species, but when you add together the thrill of the hunt with the fact that the lionfish has the potential to devastate our reefs the sum is a win-win for the adventurous diver. I can’t even begin to count all the great friends who have entered or reentered my life because of lionfish hunting. There is certainly a common bond among the men and women who are passionate about the combination of hunting and protecting the reef. Friends from Panama, Aruba, Cozumel, Puerto Rico and other places that started as acquaintances have become truly good friends over a few years of lionfish hunting efforts. I had the unique pleasure this summer of diving with a childhood friend who had seen my lionfish hunting videos and wanted to try it out. Seeing the excitement in my buddy’s eyes when he rammed the 3 prong tip through his first lionfish and jammed it into the zookeeper was a priceless experience and one that won’t soon be forgotten by either of us. There are many negative repercussions of the lionfish invasion but since this is a positive themed article I have to point out that at least the buggers were considerate enough to inhabit some really great diving destinations. With the lionfish range extending from North Carolina down to South America and encompassing the entire Caribbean, the travelling lionfish hunter has some really great hunting destinations. Most government organizations now understand how important lionfish hunting is for the marine environment so they are making it easier and easier to hunt them even in areas where spearfishing is often not allowed. Over the last couple of years I have been able to get permission to hunt in Honduras, the Florida Keys Marine Sanctuary, the Bahamas, the British Virgin Islands, and most recently on a NOAA trip to the Flower Gardens Marine Sanctuary off of Texas, all places where spearfishing is not normally allowed but special permission can be gained. I have also hunted lionfish in Puerto Rico, the US Virgin Islands, Barbados, Aruba, Belize, Mexico, and Colombia. Now my wife and I only take vacations to places where we can also hunt lionfish which fortunately gives us a lot of options. 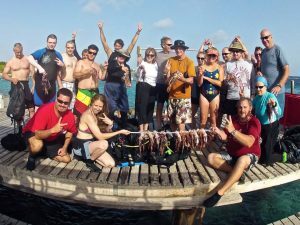 Dive operators everywhere are catching on to the fact that lionfish hunting tourism is a growing segment of a vital market. 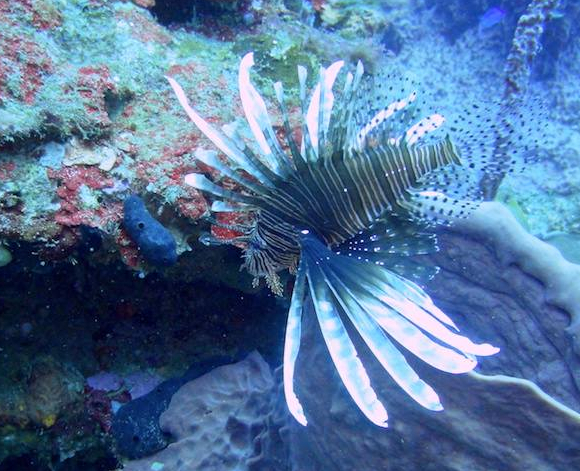 You can see the extensive list of dive operators who allow lionfish hunting here. So if you are a diver who has become a little ho-hum about your time in the water, you’re comfortable with your diving skills and you are looking for something to make your dive a little more exciting, then please consider doing a favor for the entire marine environment and taking up lionfish hunting while you’re down there. It CAN be done safely, and is guaranteed to add adventure and new friends into your life. Know about the lionfish through my diver granddaughter adrianne and her partner Andrew in st. Croix. Their group has a two fold aim- get those lionfish -celebrate friendship with a cookout after. Helping to protect those beautiful reefs. « Is that lionfish a Pterois Miles or Pterois Volitans?